President Maithripala Sirisena highlighted that the necessary Acts need to be passed in Parliament to protect financial discipline. The President was addressing Finance Commission staff after opening its new office building at Rajagiriya yesterday. With the opening of the new office building constructed at a cost of Rs.44.1 million, the Finance Commission has a permanent building after 30 years. President Sirisena said stringent laws are required to fight fraud and corruption. Therefore, the necessary laws especially relating to strengthening financial and administrative regulations should be enacted in Parliament, if we are to create a country free of corruption. The highlighted the need of equal implementation of financial regulations for both the government and Provincial Councils. “Eventhough the Provincial Council system has been in operation for the past 30 years, no proper evaluation process has been done to assess its productivity,” the President said. President Sirisena added that he had suggested that an evaluation be conducted to ascertain the relevance of the PC system to the country. Such evaluation can help identify the pluses and minuses, shortcomings, areas to be strengthened, amendments needed for the PC Act etc. 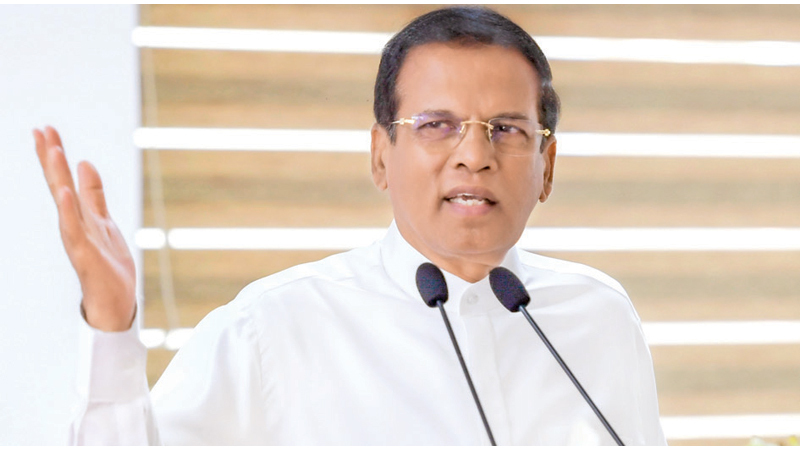 “Eventhough I made a suggestion for the conduct of such a study during the regimes of Chandika Bandaranaike Kumaratunga and Mahinda Rajapkasa, no action was taken in this regard,” the President said. He said that he doubts whether the Financial Regulations (FR) and Administrative Regulations (AR) are inactive when the PCs are concerned. It can be observed that Provincial Councils violate Financial Regulations sometimes. Then, the President brought to the notice of Financial Commission Chairman that there shouldn’t be two Codes of Financial Regulations for the Government and the Provincial Councils. “Financial discipline is a must to develop the country. It is hard to find ministries, which follow the instructions of the Auditor General’s annual report. He noted that the relevant Minister is also responsible for taking suitable action on par with the Auditor General’s report, but it is regrettable that certain Ministers may not read the Auditor General’s report,” President Sirisena said. “The Minister and the Ministry Secretary should take action in relating to the directives of the Auditor General’s annual report,” the President said. “Laws should be passed in Parliament urging the relevant Minister and Secretary to act with the Auditor General’s report. Furthermore, the Minister and the Secretary should be responsible to follow the guidelines and regulations of the Auditors Generals report. Moreover, there should be provisions with the law to punish the Minister and the Secretary, following the regulations of the Auditor General’s report,” President Sirisena said. “The main reasons for the bankruptcy of state institutions is the excessive number of staff. It is not an exception with SriLankan Airline. To my mind, there are only 24 aircraft but the total staff exceeds 7,000. There are rules and regulations for recruitment with every Ministry and state institution. But no action has been taken against the Minister, Secretary or other responsible officers who violate the recruitment guidelines,” the President noted. The President said that he can name state institutions, which waste large amounts of state revenue, but he is not ready to name those institutions right now,” the President added. He further added that the ways of filling the budget deficits is not practical. Therefor the budget deficits cannot be filled. How many proposals forwarded to fill the budget deficit is implemented, the President questioned. The President said that most countries including Singapore have implemented novel technology for governance. Singapore maintains a file with the computer data base regarding each tree in the country. Such systematic approach helps to good governance, the President said, while speaking on the destruction of forests in our country. Speaking on the functions of the Commission, the President said that there is a close connection between the Finance Commission and Provincial Councils. The President while highlighting a mistake made by the Finance Commission said that in accordance with the country’s Constitution, there is no Central Government and Provincial Governments in the country, but the Government and Provincial Councils. President Sirisena further said that the Singaporean government takes the shape of an institute of public–private partnership. The President while quoting a saying of a university lecturer, said that there are no Wild Elephants (Wal Ali), Weedicides (Wal Nasaka) and so on but Wild People (Wal Minissu). It's the election year? it's too late now to close the stable door after the horse has bolted, but you still can save the rest if you take action immediately. I doubt anything will happen in the near future, you can't compare Sri Lanka with Singapore because those Singaporeans are proactive and gifted with farsightedness. It's a sorry state of affairs - wait till the last tree in the forests is cut and taken away including oil and gas if available all the resources to their countries. And our politicians will get more rewards from their colonial masters. May GOD bless Sri Lanka!! !